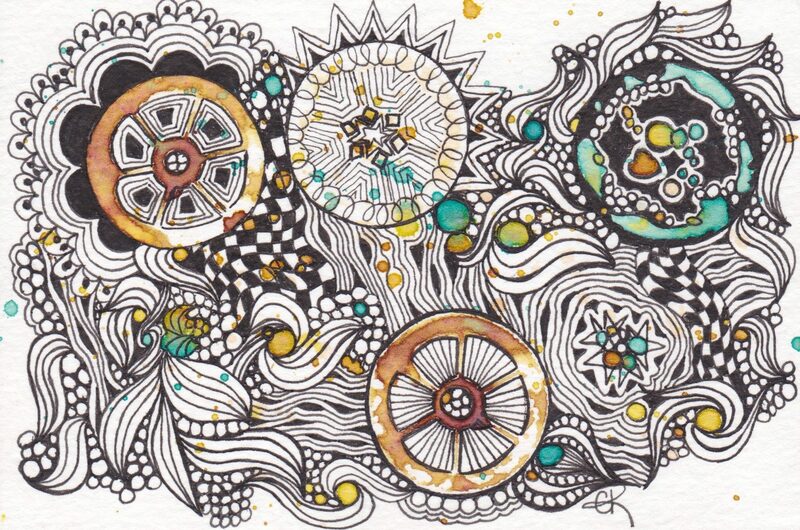 This week, I was privy to a discussion amongst Certified Zentangle Teachers (CZTs) as to whether or not we still use this art to unwind and chill, or has it become all work for us? And it did provoke enough thought to make The Diva focus this weeks “challenge” (#285) to really make me think more about it. Most of what I post to the world, here, on FaceBook, and Instagram, are works of Zentangle Inspired Art (ZIA) that are truly amazing to me. I often reflect back at them and am in awe that I even did that…that it came from my pen. I get so focused at times on shop models and preparing for upcoming classes and creating art that I do lose sight of why I started doing this in the first place. Where do I find my Zen again? I often tell my students, whatever makes it Zen for you is what you need to do, but rarely follow that adage myself. I started this tile last Saturday at our San Diego retreat Tangle By the Bay. I rarely finish things I do at retreat and classes, but I found this simple white Apprentice tile calling my name to come back. So this morning, with my nice cup of Earl Grey tea, before my morning walk, before the madness of my day (but after the cat woke me up too early because he was hungry) I picked up my pen and finished it. The tangles were chosen by the roll of a dice. As were their enhancers. I would not have chosen to put them together on a tile, I don’t find it all that aesthetically pleasing, but I felt really calm working on it. The tangles were ones I know…I didn’t have to struggle with them. I rarely use sparkle as an enhancer because I am not particularly good at it. I never make my Printemps that big because they get wonky. My rounded Crescent Moon took on a whole new look. Cool, eh? And I was trying out a new pen (Pentel Hybrid Technica 04) that took a bit longer to dry, so I had to be even more patient. Zen Found! I did actually finish everything I started at the retreat, which is a wonder for me. We learned the 14 Shades of Gray technique, and I did this piece. Again with some fairly simply tangles, but it was fun. Calligraphy classes start the 2nd week in October, so if you are in the area, be sure to check it out. Payment is to the teacher (Risa Gettler), so call the shop to sign up (951) 972-3015. Leave a message…I am on vacation starting Wednesday, but Olivia will be in the shop on her regular days while I am gone. Place your supply order at the time of Registration and your supplies will be waiting for you on the first night of class. Continuing Italic Calligraphy – 6 Weeks. Thursday Evenings 6-8 pm ($120) – Starts Thursday, October 13. Now is the time of year when we want to use our calligraphy skills. This 6-week course is for those have taken calligraphy and want to review, refresh, revitalize and expand your command of Italic Calligraphy. We’ll review the letter-forms, proper ruling of paper, gouache and pen preparation, accurate ruling, posture, and breathing. Each student will bring his/her own project to work on consisting of words you love and long to write: It can be a quote, prose, scripture, et al. By working on your project we’ll learn various lay-outs and designs, word spacing, flourishing and many other elements that comprise a finished piece of calligraphic art. You’ll have my individual attention in each and every class. There will be a presentation of your work on the last class. Nibs: For those of you who’ve had calligraphy experience you have your favorite nibs. For those who are relatively new a Speedball C-2 or C-3 is a good nib to start with. I like Mitchell nibs because they’re flexible. The letters are more lively and they help you develop a lighter touch. I recommend you try both and start to learn your preference. Handles: Again, many of you have your favorites. Mine are Koh-I-Noor #127N because of the soft cork grip. Paper for practice and final project. Participants should bring in a poem, quote, scripture, et al that want to use for their final project. Individual attention on every letter and with their Final Project. Make up classes available. Papers: practice and for final project. And now, back to work on my Travel Journal for the trip…oh, and packing! Next week’s post will be from Germany! Very nice and relaxed tiles, using a dice can be a great instrument to help creating a tile without great intentions. I like the DIva’s tile and also the other one with that “misty” accent! Interesting to read as your thoughts were very similar to mine. Once you know you are going to post a tile, you’ve added pressure. We all need to step back and rethink what we are doing to our “zen”. I do like the tile you came up with and the one moving to shaded it super as well. Nice tiles! Really like the shades of grey one. Have a great trip. Lovely work! I especially love your grey fade-out. Very cool! Great thoughts (thanks for sharing them) and pretty tiles. I love your relaxed tile (and the 14 shades of grey for it’s stunning simplicity). I like the idea of using dice to choose a tangle – a good way to encourage putting together tangles you might not “plan”. Had to laugh at your comment about the cat waking you up to be fed – that’s my daily alarm clock! I love your big Printemps. That worked out really nicely. I always get mine too small and then get stressed about it. LOL Your “Relax” tile is very nice and relaxing. I really like it. And your 14 Shades of Gray tile is wonderful. I love that technique and try to use it whenever I remember. So many options and so little time. And your going to Germany? How wonderful. I know you’ll have a great time. Lovely work. I discovered that I relax better with some structure, starting cold actually makes me stressed.